In this issue: The return of the Red Menace! When Hank Pym receives news that his old FBI contact Lee Kearns has been captured in East Berlin, he heads off on a solo mission behind the Iron Curtain to track Kearns down and free him. In the course of doing so, he learns that the Reds (which, by the way, is the only referent to the baddies in these pages; unlike previous "Red" stories, this issue avoids the words "Communist", "Socialist" and "Soviet" alike) have accidentally invented a super-ray which gives gorillas human intelligence. Fortunately, Pym is able to gain the upper hand when he turns the ray on the German officers and is delighted to find that the ray has the opposite effect on humans, giving them the intelligence of apes. It's a good thing it didn't end up making the humans super-intelligent - which would have been my guess! And yet at the end of the story, one question remains: Man, what IS it with the Reds and their intelligent apes? This is Pym's idea of travelling incognito. 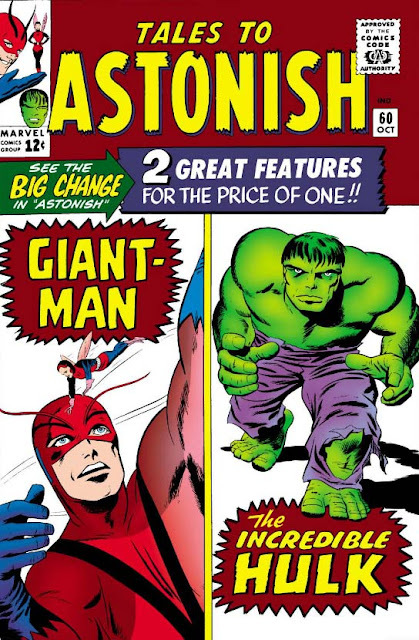 Despite being a solo story, this story unusually has a couple of callbacks to Tales to Astonish #44, which contained the first appearance of the Wasp. For one thing, a footnote points to that issue being the previous appearance of Kearns, and it is - if just barely. See, at the end of that story, Pym phones up Kearns to tell him that he & Janet have defeated the Creature from Kosmos. Kearns gets one snippet of dialogue in response - unseeen and in a single panel. Hardly meaty enough to dig up the name 16 issues later, is it? More significant - if also more problematic - is Pym's decision to tell Jan about his "secret origin" from that same issue, when he lost his new wife Maria to Red forces in Hungary. I noted at the time how odd it was to give Ant-Man a deeply personal, unsolved mystery, yet go nowhere with it; here again it's odd to bring up the story - as if to refresh readers' memories - and then not follow it up. (Perhaps Stan originally had an idea on where that was leading, but realized it could be problematic to further develop the romance between Pym and Van Dyne if he continued to hint that Hank's wife might still be alive somewhere.) Fortunately, in the 1980s writer Steve Englehart would finally revisit and resolve this plotline in the pages of The West Coast Avengers. 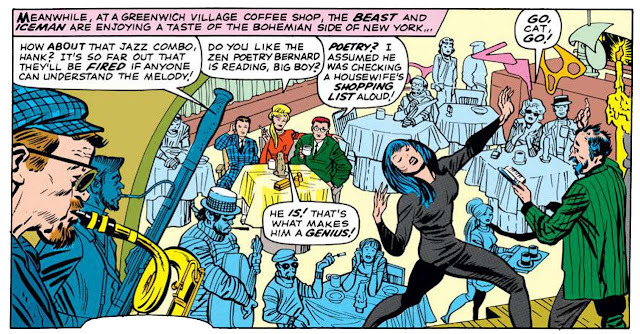 In fact, Englehart's storyline would additionally include the return of not only this issue's superintelligent gorillas, but also that of Madame X, the Scarlet Beetle, El Toro and The Voice! Guess Steve was a pretty big fan of these early Hank Pym adventures, huh? They're gorillas! But they're intelligent! But they're gorillas! 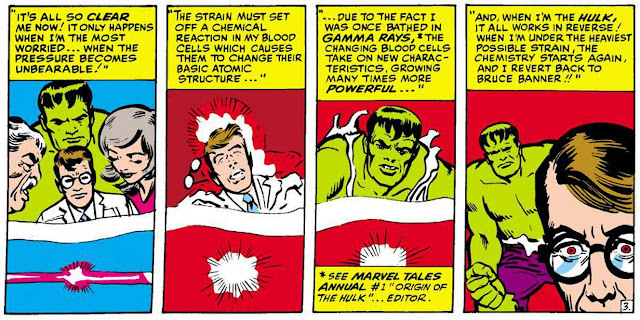 Banner realizes the nature of the beast. Whoops! 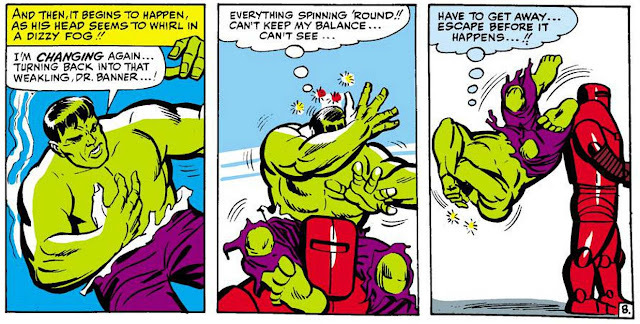 Little Hulky's falling off this ride. These aren't graduation caps affixed to their heads. They're incredibly unfortunate secondary mutations. After having debuted in issue #4, and returned in every issue since, the Brotherhood of Evil Mutants will take a break for a bit after this story, unseen again until issue #11. Last time, they tried to recruit the Sub-Mariner and failed. (Amusingly, because the arrogant-yet-chivalrous Namor didn't appreciate the way Magneto spoke to a lady.) This time out, the Brotherhood heads to to the carnival to recruit The Blob! Hey, they probably need a bit of a powerhouse in their ranks, don't you think? And yet this new alliance is trounced once again by Mag's inability to play well with others, or even marginally conceal his contempt for those he considers beneath him - which, let's be honest, means just about everyone. At the end of the tale, The Blob turns his back on both heroes and villains, dejected, and returns to the carnival ... the only place, he believes, a freak like him can ever truly belong. Dig this swingin' sixties hangout! We'll be seeing a lot more of this. 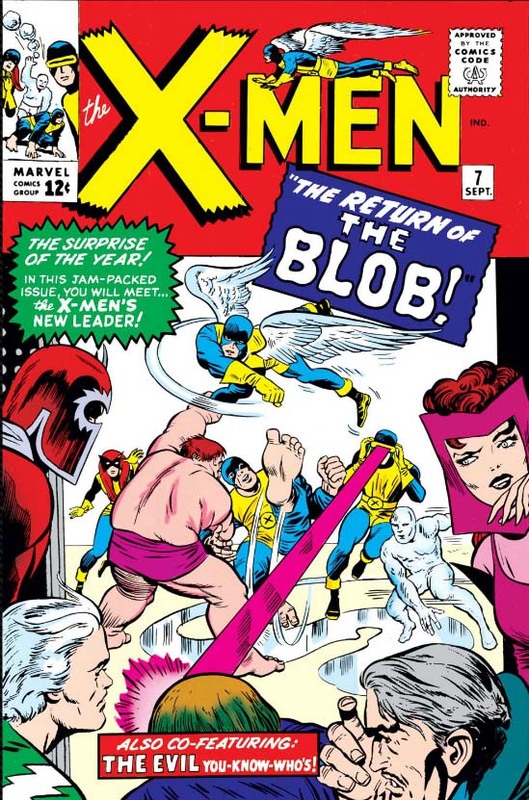 The rest of the plot is fairly pedestrian, as the main importance of the issue is the introduction of elements like Cerebro and the X-Men working on their own, as well as continuing to flesh out the characters' lives via new settings and situations. To this end, we get our first trip to the Cafe A-Go-Go (though not named as such in its first appearance) over in trendy Greenwich Village, and some of the regulars of that joint, such as Bernard the Poet and Zelda. 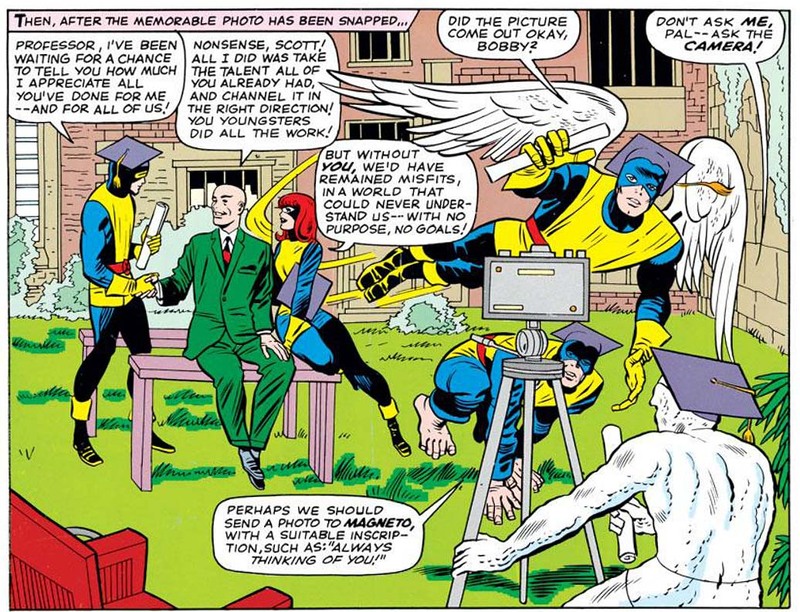 Meanwhile, Scott Summers - already a tightly-wound young man - settles into his new role, and is further cemented as the personality he'll become known for: seemingly destined to bear the weight of the world on his shoulders. Scott as grim and lonely leader. We'll also be seing a lot more of this...!